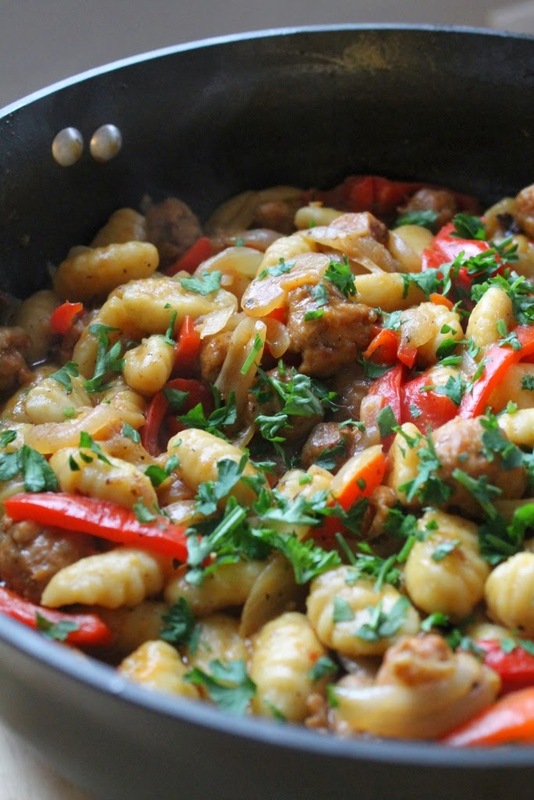 Up the ante with this dinner of hot Italian sausage served with gnocchi, red peppers and onions. Finally March is over. I wouldn't normally be so happy but March has not been a very good month. I am ready to say goodbye and move on to April. Hopefully April will bring warm weather and sunny skies. The end of the month also means it is time for The Secret Recipe Club reveal. I had a newbie from New Zealand, Couscous and Consciousness. She had many tempting dinners to pick from but ultimate I ended up with Italian Sausage with Gnocchi and Red Peppers. The night I made this it was cold and rainy outside. I couldn't think of a better way to warm up than with this comfort food dish. The recipe was essentially just how I made it only I subbed out lemon juice for the original preserved lemon and added some onion. I was a bit skeptical on how it would turn out once I put in the chicken broth but was happily surprised to have the liquids thicken right up. The hot Italian sausage made the dish a bit hot but you could use sweet Italian sausage if you don't like heat. Overall the flavors were bold but the dish wasn't too heavy as it would have been with a tomato sauce. We will be certainly having this again. Thanks for the great recipe, Couscous and Consciousness! Remove the sausages from their casings and break the sausage meat into bite-sized pieces. Set a large skillet over medium heat with a tablespoon of olive oil. As soon as the oil is heated, add the sausages pieces. Move them around in the pan from time to time, until they begin to brown. Once the sausage is browning add the red pepper and onion strips. Sprinkle with a small touch of sea salt and continue cooking until the sausages are brown and crispy and the peppers softened. Remove from the pan and set aside. While this is cooking, make the gnocchi according to package directions. Add another couple of tablespoons of olive oil to the pan, and then add the gnocchi. Stir them around to coat them all in the oil, and then fry for a few minutes to brown a little. Pieces will stick to the bottom of the pan. As soon as the gnocchi have browned a bit, add the sausages and peppers back into the pan, stir to combine. Add the bay leaf, lemon juice and chicken stock. Stir and scrape the bottom of the pan to loosen all those stuck bits. Cook until the liquid thickens. Remove from the heat and discard the bay leaf. Sprinkle parsley over the top and serve immediately. I am the most horrible blogger/social media person. I finally got around to painting the guest room and didn't take pictures. I think Mr. J might have snagged a few so here is to keeping fingers crossed for before and after shots. I also went to a baby shower. No photos. Not a one. The theme was books and it was super cute. And I am now in love with 3 Sprouts. I am currently trying to figure out how to have kids things in the house without kids and not be super creepy. Between the painting and the baby shower the weekend was pretty well filled. Now if only I had another weekend to relax. Six months ago today we moved into our little house. It seems so recent and so far away all at once. We are certainly more settled and it really feels like our home. That being said, there is so much work we still want to do and need to do. This week we had some one come look at our trees - there is one in the backyard that needs to come down. We also have some woods that need a bit of picking up. It is not a huge portion but when winter reveals lots of downed trees and branches we decided it needed some sprucing up. Of course all of this came with a price tag. A steep one at that and now we are deciding what are the priorities. I try not to dwell on all of the dollars too much and instead focus on making the house more of a home in smaller ways. One of these ways is using the kitchen, baking, and eating together around our dining table. I made this blueberry buckle after seeing the recipe on the King Arthur's Flour website. It made the whole house smell like cinnamon goodness. Now that is my kind of home. Mix the sugar, flour and cinnamon in a small bowl. Cut or rub in the butter or margarine with the side of a fork or your finger tips until it reaches a crumbly state. Set aside. Sift the flour, baking powder and salt together in a medium sized mixing bowl. Set aside. In a large bowl cream together the sugar, butter or margarine, egg and vanilla. Alternately add the milk and the flour mixture to the creamed mixture, ending with flour. Stir only enough to blend. Fold in the blueberries. Pour the batter into a well-greased and floured, 9-inch cake pan. Sprinkle the topping over the batter and bake for 40 to 45 minutes or until a cake tester or knife comes out clean. Let the buckle cool for 10 minutes before serving. Today just might be my favorite post day each month. It is the monthly posting for Pass the Cook Book Club. This month Kita chose Clodagh's Kitchen Diaries, a cookbook set up as a dairy matching up recipes with holidays and other happenings by month. I hadn't heard about this cookbook before now. One of the best parts of this club is finding out about a new cookbook. The three recipes to pick from were hot cross buns, ravioli or Scotch eggs. The baker in my wanted to make hot cross buns but I just wasn't feeling it when it came down to it. If I had more time I would have made the homemade ravioli. Fresh pasta is on my bucket list. However when my husband found out about the Scotch eggs there was no turning back. The recipe was easy to put together and I had all of the ingredients on hand except for the ground sausage. I think the worst part was peeling the hard boiled eggs and then cleaning out the frying pan. Nothing about this dish screams out to me as amazing. The spices as well as the sausage seasoning gave them lots of taste but for me it was too much fried meat. I tend to be pretty sensitive to such things. I had one and that was enough. My husband on the other had promptly ate two and claimed the remaining one for breakfast the next day. I am still glad this was the recipe I picked. This is not something I would ever make on my own and I think they look fun with the layers of colors. Put the eggs in a pan of cold water over high heat and bring to a boil. Reduce heat and simmer for exactly 7 minutes. Drain and cool the eggs under cold running water. Gently remove the shells and set eggs aside. Put the thyme, parsley, mustard, lemon zest, and scallion in large mixing bowl and combine. Add the sausage and incorporate the mixture evenly throughout the sausage. Season with salt and pepper to taste. Using a quarter of the sausage mixture at a time. Roll the meat into a ball and put it on a piece of plastic wrap and press slightly. Cover with another sheet of plastic wrap and gently roll into a circle, about 2” across. Remove the top piece of plastic wrap and put a boiled egg in the center of the sausage mixture circle. Close the mixture around the egg using the plastic underneath as an aid and round until you have the perfect egg shape. Remove ball from plastic and set aside. Repeat with the remaining eggs and sausage mixture. Put the beaten egg in one bowl and the breadcrumbs in another. 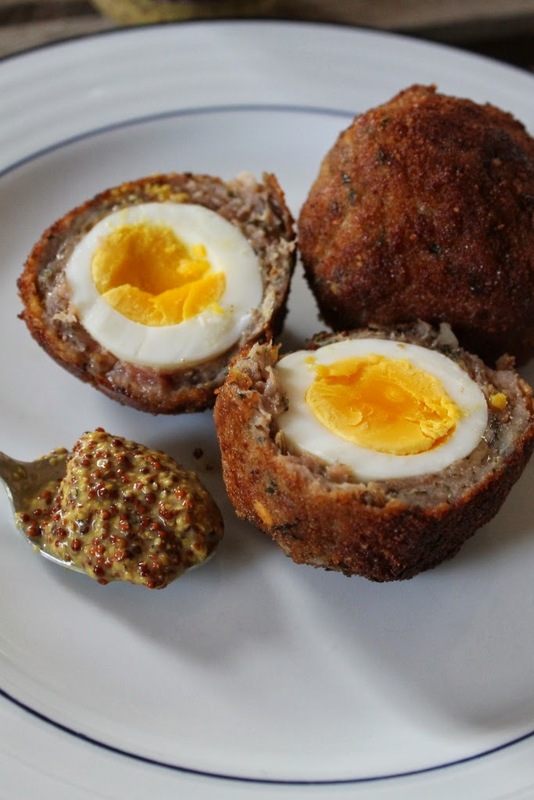 Dip each Scotch egg into the beaten egg, then roll it in breadcrumbs. Continue until all eggs are covered. Put a shallow pan over medium heat and pour in the oil until it is about 2/3rds full. When it is hot, carefully drop in the Scotch eggs and fry them for 10 minutes, turning every few minutes to make sure they are evenly fried. Remove from oil and drain on paper towels. Serve at room temperature with Dijon mustard. I realized as I was putting this post together today that my eats this week are almost exactly the same as last week. I always thought that my meals, at least breakfast and lunch, when I am traveling are almost identical but I thought I switched things up more when at home. Turns out not so much. Breakfast was a bowl of Voskos blueberry yogurt, berries and pecan granola. Lunch was a quick but delicious salad. The night before I had the same thing for dinner. As I made the one for dinner I did double duty and made one for lunch as well. Dole Caesar salad bag mix was the starter than I added some spinach leaves, tomatoes, hard boiled egg, leftover prime rib and avocado. Best. Salad. Ever. Dinner was Mexican pizza. This week we started with a layer of refried beans, then a few leftover black beans, followed by chopped onions, red pepper, tomatoes and spinach. Topped with cheese. Being gracious has been on my mind a lot lately. Also known as being courteous, kind, pleasant, and in general a good person. I am so lucky in so many ways there really should be no other way to act. I think about the people lost on the Malaysian flight. I think about those missing in the mudslide in Washington state. Even my worst day doesn't come close to comparing anything in those tragedies. And that also brings me to my latest read. It was a downer. Cancer is never a good thing but in children it seems even worst. "The Fault in Our Stars" is by John Green. Hazel Grace Lancaster is 16 and a three-year stage IV–cancer survivor. To help deal with depression she is sent to a support group where you meets Augustus Walters. They become good friends as they navigate the ups and downs of their illness. As they share experiences, Hazel introduces Augustus to An Imperial Affliction a novel about cancer with no ending. They both dream up potential futures for the character and make it their mission to visit the author to seek answers. The story is about life, love and death seen through the perspective of young adults trying to figure out the world they have barely been a part of. It is a tearjerker for sure. Thick and Chewy cookies made festive with Easter colored M&Ms. We had a fun but worked filled weekend. Mr. J's parents were in town for some house projects. It is crazy how much you can do when you just get right to it. It doesn't hurt that my FIL is contractor and comes with loads of knowledge and tools. My contribution is making sure everyone is well feed. Mr. J was giving me a hard time last week that we were lacking desserts. I am not sure if that was a true assessment of our pantry but I aimed to squash those thoughts with some cookies. M&M cookies are my second favorite cookies. Second only because I have set standards which are difficult to find. I like thick and chewy cookies when it comes to M&M cookies. And of course they need to be packed full of M&Ms. I picked up these Easter colored M&Ms and thought they would be the perfect treat to have on hand for work breaks and throughout the week for Mr. J. So far...mission accomplished. In a stand mixer, cream the brown sugar, white sugar, butter, eggs, and vanilla on low speed until well mixed. Add the 2½ cups flour, baking soda, and salt. Mix until just combined. Add the extra tablespoons of flour until the dough feels thick and almost dry to the touch. By hand incorporate the M&M’s into the dough. Roll into large balls. Flatten slightly with your palm or the back of a wooden spoon. Bake for 8-10 minutes until barely cooked through. Remove from cookie sheet right away and place on cooling rack. Let stand for 5-10 minutes to help the cookies hold their shape. This traditional Latin American dish is the local hash made with ground beef and tomatoes. My husband gets on food kicks. Lately it is Cuban food. This is both good and bad for me. It means he does lots of research and wants to cook dinner. A major plus. The con is that normally what he picks out is elaborate. It requires an extra trip to the store for ingredients and leaves the sink heaping with all the dirty dishes once the cooking is all said and done. This is the second time we made picadillo. We originally had it at Bongos, the Cuban restaurant, in Downtown Disney. The olives and capers make the dish super salty in my book but that is easily parred down but not adding any extra salt and serving with black beans or rice. Mr. J likes to top his plate with an egg and thinks the potatoes are the best starch for the dish. Heat oil in large skillet over medium-high heat until shimmering. Add onion and bell pepper and cook, stirring occasionally, until softened, 5 to 7 minutes. Add tomato paste, garlic, cumin, oregano, 1 1/2 teaspoons salt, 1 teaspoon pepper, and bay leaves and cook until fragrant, about 2 minutes. Add wine and cook until reduced to 1/4 cup, about 5 minutes more. Add meat stirring to break up chunks. Once browned, stir in tomatoes, Worcestershire sauce, olives, capers, brine, and potatoes. Cover, reduce heat to medium-low, and cook until potatoes are tender, about 12 minutes. Remove cover and season to taste with salt and pepper. Remove and discard bay leaves. Serve with an egg cooked over easy and topped with scallions if desired. I haven't been updating my latest reads with you in a very timely fashion and thought I would take some time to let you know about one of the books today. Alice Buckle is a middle age wife about to celebrate her birthday. She will now be older than her mother when she died in a tragic car accident. This along with some other unsettling details in her life lead Alice to seek solace in an online research survey about marriage. 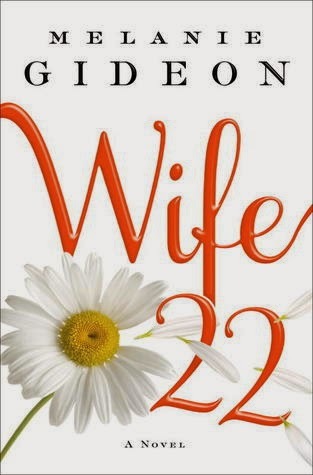 Suddenly she finds herself answer intimate details of her family and marriage. These response evoke strong memories of the past but also leads her toward a personal connection with the researcher. This novel is a story of a woman losing her identity through the monotonous details of her family life only to find herself again. The questions raised suggest that potentially her life now doesn't fit her found again self. I am so ready for the weekend. It is always a sad thing to think it is Friday on a Tuesday. That is what happened to me yesterday. I was all about it being Friday. It just felt like a Friday. Much to my dismay though it was not. I am still willing Spring to come with eating as if it is warm outside. Lots and lots of berries. Breakfast was a yogurt parfait with plain Greek yogurt, pecan granola, and topped with a banana and strawberries. Yum, yum! Lunch was on the way home from a early morning meeting. I forgot to take a picture but it was at a sandwich shop about 15 minutes from where we live. Their chef salad was topped with freshly sliced roast beef and smoked turkey, brie, grilled red onions, cucumbers, and tomatoes. It was served with their house dressing, a buttermilk cucumber dill mixture. Amazing. I cannot get it out of my mind. Dinner was Mexican pizza. We haven't had Mexican pizza forever. Why does guacamole make everything right in the world? I need to make sure this meal goes make into the regular rotation. These brownies are going to be the end for me. Too good. I love pizza night. I am of the belief that it cannot go wrong. Any combination we put together ends up darn delicious. And all though it takes a bit of advanced planning to have all the ingredients on hand it is a relatively easy dinner to put together. Our latest version was mushroom and spicy sausage. I have a love/hate relationship with mushrooms. In some meals I just cannot mouth them. Others I cannot get enough. This week at the grocery store I saw heaps of shiitake mushrooms. Shiitake mushrooms look a bit more funky but have unique taste different than the more common white mushrooms. After immediately seeing the mushrooms I knew that they would be a key ingredient for pizza night. Of course, Mr. J insists on meat so I added hot Italian sausage. One package divided for two meals this week. Can we just talk about garlic? My new favorite thing is taking cloves of garlic. Mashing them once with the back of a knife and adding them whole to pizza. Marvelous. The only problem is you have to watch what you do after the pizza because you will have garlic breath. That and the pizza disappears way too quickly. Preheat oven to 420 degrees. Prepare pan by sprinkling cornmeal on cookie sheet or pizza pan. While oven heats, cook ground sausage in a medium saute pan on medium high for about 5 minutes or until just brown. Add chopped onion and cook until just soft, about 5 more minutes. Set aside. Roll out pizza dough to desired shape and size. Place in prepared pan. Top pizza dough with pizza sauce and spread evenly across all dough surface. Evenly distribute the sausage and onion mixture on top of sauce. Do the same with the shiitake mushrooms. Finish pizza with sliced mushrooms and garlic pieces. Bake in oven until crust browns and cheese is bubbly, about 20-25 minutes. Cool slightly before slicing. I was in the mood for brownies. It being St. Patrick's Day and all I thought about creating some amazing boozy, mudslide type treat. I was about two seconds away from starting when I realized it was time for some cookie dough. After being sick and all last week I didn't get any cookies. A rare occurrence for me. I think it finally caught up and my body was revolting. I wish cookie dough could be a food group. I have eaten my fair share of cookie dough in my time. The real stuff - eggs and all. I haven't ever gotten sick besides from the occasional way, way, way over indulgence. My mom would always get super upset. She has this thing about the safety of food. I kind of think she would prefer to throw out all food a day before it is set to expire just to be safe. Don't even get her started on deli meat. Needless to say raw dough is a no, no. No fears here though. This cookie dough is egg free and taste just like the real stuff. There was enough to layer on a thick bit for the brownies' frosting and some leftover. Of course Mr. J and I had some taste tests and I am already dreaming about adding the rest to ice cream. The recipe that keeps on giving. These brownies were fabulous. The perfect brownie/cookie dough combination when you bite in. I am already foreseeing a fight in my future over the last one. Cook brownies according to directions for a 9X13 pan. Allow to cool for several hours. In the bowl of a stand mixer, cream together the butter and sugar at medium speed. Sift the flour and salt and add to the butter mixture. Mix until combined. Add the milk gradually until desired consistency is reached and beat until fluffy. Gently fold in chocolate chips. Frost cooled brownies by gently spreading the frosting across the brownies. I used a combination of a knife and fingers. You will have extra. Store in refrigerator. I really think life would be better with three day weekends every week. Of course if that were to ever come true I would probably just up it and want four day weekends. But seriously, how do they go by so quickly. Friday was a long day at work.I was just ready for the day to be done because Mr. J and I had a date planned at a local restaurant, Whitfield's on the Green. It is our favorite. Before the move it was like 2 minutes away, now it is more like 10 minutes and you have to get on the highway. The drive seems so far but totally worth it. We started with this amazing tuna tartare. It was a special and I called it as the dish was brought to someone at the bar before we were seated. Saturday I spent most of the day priming two rooms - the dining room and the guest bedroom. Primer stinks big time. I think I killed several brain cells with this task and I questions Mr. J's intentions as he had me handle this project. We haven't primed the other walls but the dining room had the major wall paper glue and the guest bedroom had dark two toned walls. Hopefully we are done with the priming and our walls will turn out beautiful once painted. Today was all about relaxing...almost. I started off with hot chocolate and this egg sandwich made by my husband. I am not sure if he felt guilty over the priming or he was sweetening me up for his project later. See about 10am I heard some awful racquet in the basement followed by the table saw. Apparently he decided today was the day to rip out some old storage shelves and build himself a work bench. Now this is really his space and I could care less about what happens in the basement but a bit of advanced warning would be nice. Arg! I am just keeping my fingers crossed that it turns out nicely.